For a long time, I had no idea what the word "astonishment" meant. Don't get me wrong, I understood the definition of the word, however, I did not realize the meaning. What I mean is this: extraordinary things would happen from time to time. If, in the past, I witnessed a great sports upset or walked in on an aunt in the restroom, I would consider situations like that to be "astonishing." Then, I witnessed a childbirth (stay with me, Traveler). Have you ever seen a person pulled out of another person? I'm talking about a naked little person being pulled out of the person you love more than anyone else. When you are unsure if you are there to meet death or just nod at it as it brushes past in the hallway, when perspective -and time itself- shifts and you are handed a small purple person who looks like you… THAT, my friends, is astonishment. I have only been astonished once. You may be wondering why I am telling you all of this, Traveller. Please bear with me. If you put your ear to the rails, you can hear the point coming. Now, allow me to introduce you to a rather bizarre, proto-carnivorous, and useful plant. YES, UNICORN PLANT FLOWERS HAVE PHYSICALLY MOVING PARTS WHICH ARE DRIVEN WITH EVOLVED PURPOSE. While I consider this to be the fact of the blarticle, and it will be shouted from its balcony with the greatest excitement, it serves as an example of something extraordinary that I once would have deemed "astonishing." So I'd like to welcome you--properly, now-- to the world of Proboscidea parviflora. Having your vegetable garden physically writhing while you are away from home is not astonishing; it is just strange and unusual. 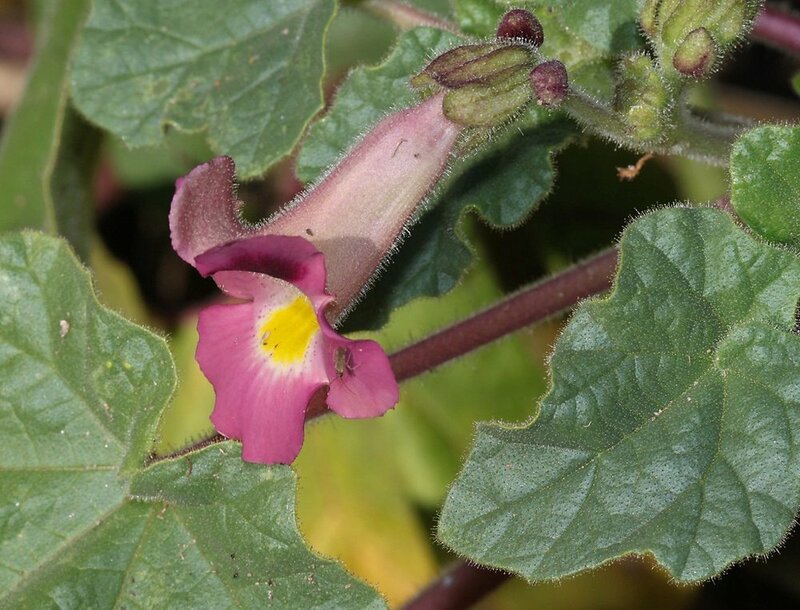 Aliases: devil’s claw, doubleclaw, aphid trap, cat’s claw, martynia. (Sp.) una de gato, cuernitos del dia. Martyniaceae Characteristics: members tend to have opposite leaves, and glandular/non-glandular hairs attached to all above ground components of the plant. There are only 4 genera and 12–15 species in the Martyniaceae family. Binomial Etymology (Proboscidea parviflora): Probosc- means “that which examines;” -idea is presumed to be a generic suffix; parvi- means small while -flora denotes a flower. Proboscidea is derived from the Greek word, proboskis, which was used as a reference to the long curved protrusion at the end of the fruits of the unicorn plant. This native annual plant has a notorious smell and a prostrate growth habit; all above-ground parts are covered in glandular hairs. The hairy leaves are heart-shaped to kidney shaped and sticky. The flowers are funnel shaped, five petaled, and showy. The flowers bloom from August to October.The fruits can be around seven inches long and green when underripe and much like a pepper with a hook on the end. When ripe, the fruit turns black, dries and splits. The stigma is two-lipped and moves (closes) when touched. P. parviflora usually occurs in flat gravely-to-rocky areas of the American Southwest. P. parviflora was considered a topical pain reliever to treat rheumatoid arthritis by the Pima . The fruit of closely related species in Mexico are apparently are cut and boiled as a tea to treat headaches. The Pima people used the black seed pods extensively in basket weaving and for creating a black dye. The sticky leaves may be used to remove lice from your chickens . The seed pods are evil looking and can travel long distances by hooking on to ungulate ankles or by getting tangled in wool. The stigma is two-lipped and apparently closes like a venus fly trap (thigmatropic motion) when touched by a bee in an effort to trap pollen. YES, that is right; this flower moves. If the flower is not fertilized, the stigma will open again. This is a characteristic that can be demonstrated in your garden. I am willing to bet this closing motion helps the plant to avoid selfing as, say, a bee’s “back fur” would rub on this stigma and the stigma would quickly close before the bee recieved any pollen from the flower. You can see in the below video that the anthers are behind the stigma on the flower. Pull Up Your Plants! (PUYP) is now receiving visits from all over the world. Please take the time to leave a comment or subscribe below. I’d like to hear about your experiences with the Unicorn Plant.